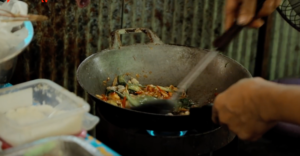 Home Food Hands-On Experiences in Thailand! Sanook is a Thai word that loosely translates to fun, but its not just leisurely fun. Because in Thailand the best way to enjoy sanook is be in the moment and to experience everything hands on. Follow Justin Foo as he takes this philosophy to heart and finds joy in four unique hands on experiences, across four destinations. 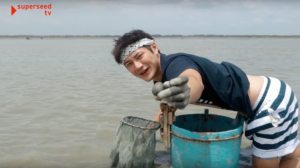 Located just south of Samut Songkhram town near the mouth of the Mae Khlong River, Don Hoi Lot is named after the shellfish, known as razor clams or “worm shells” in English. Which are caught here by the basket load when the tide is low. The vast muddy flats is abundant with several other edibles molluscs, including scallops, clams and cockles! Not your average day at the beach! If you are looking for a day of excitement, and you don’t mind getting your hands and feet dirty you can take a long tail boat to go digging for razor clams! 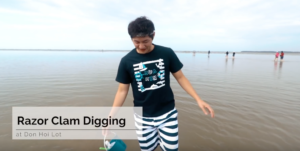 Equipped with just a cup of lime salt and a stick to poke in the sand, you will be able to experience the thrills of a Razor Clam Digger! What’s your reward? A deliciously cooked meal of fresh razor clams! There is nothing sweeter than the fruits of your labour, and even if you don’t catch enough razor clams, do not fret as the nearby markets are stocked with freshly caught seafood! Nothing is sweeter than the fruits of your labour! Traditions are worth their weight in gold! Benjarong Porcelain Village is a little colourful village well known for being where Thailand’s famed Benjarong porcelain is fired. 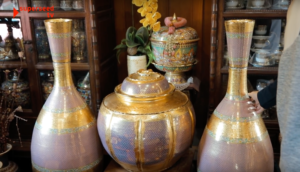 The ceramics produced here are of the finest quality and is sought after by many of the top porcelain collectors! In the village you will be able to learn the rich history of Benjarong as well as observe the artists who are keeping the traditions alive. 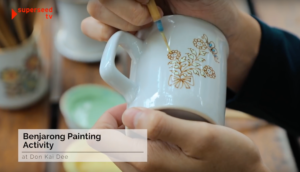 Most noteworthily the most popular option is to paint your own porcelain cup, which you can bring home! You can bring home your own porcelain cup! Baan Sillapin Artists Village is Hua Hin’s original arts centre and includes large galleries of arts and antiques, artist studios, a coffee and gift shop. This artist village is consisting of 15 artists with their own distinct styles and specialties. Above all they also offer classes and creative sessions to engage with the visitors and the local community! 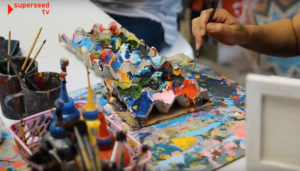 But most importantly Baan Villapin is the playground for you to channel your inner artist and express yourself through art. Earlier in the article we mentioned Razor Clam Digging at Don Hoi Lot. While if you are more inclined to other shell fish you can certainly go to Bang Khunsai. Where instead of hunting for Razor Clams you will be hunting for sea cockles and clams. Instead of a cup of limestone and a stick you will grabbing through the mud with your hands! A stool like transport is used to keep yourself from being completely soaked. As seen in the image below. Just like the Razor Clams, due to your hard work you will be able to enjoy a lunch using the cockles and other assorted shell fish that you have caught! Because most Singaporeans get their seafood through the supermarket, this will be the freshest seafood you ever tasted! If you are interested in immersing your trip to Thailand with exciting and local experiences, remember to include these fantastic places. As they will definitely be “sanook”! Previous articleWhisky Distillery in Nantou!